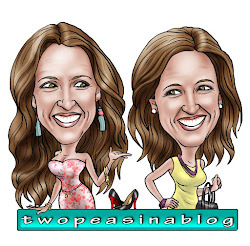 Sharing an easy to wear holiday look that's classy and affordable. If you're in need of a Holiday outfit for a party, Christmas Eve or even New Year's Eve, then this post is for you! The Nordstrom Trend Department has so many options for the girl who wants current trends without a high price tag. I was in search of something I could wear during the Christmas season, something a little different from the jeans I wear almost daily. I found these metallic pants and knew I wanted to try them. I fell in love with the shiny fabric (perfect for the holidays) and the loose cropped fit (comfort)! They are like wearing pj pants. I paired them with classic black, but I think they would also be gorgeous with a festive red sweater or a dreamy ivory sweater!! Awww, this sweater!! 3 layers of ruffles!! And a peplum fit! Just gorgeous. And can you believe it's only around the $50 mark?! For size reference, I'm wearing a small and it fits perfect. What I love about the sweater is that it looks great with these metallic pants but will also work with my favorite everyday jeans!! Nordstrom is always my go-to store for so many reasons including their selection, high quality and free shipping and returns. But their trend department is one of a kind. I can find what I need for any occasion. Make sure you check it out. I know you'll find pieces you'll love!! Those pants are so fun!!! Gorgeous top! 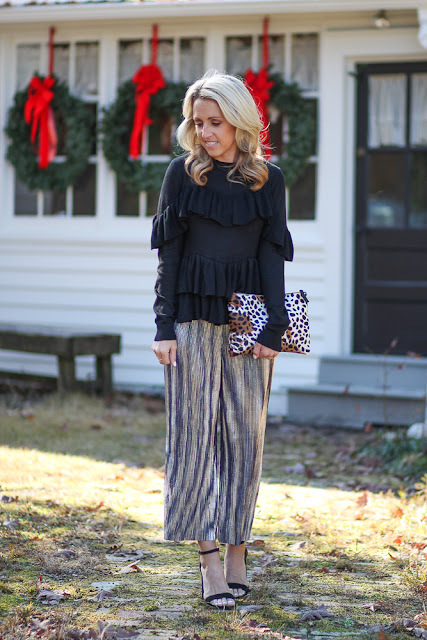 Love how you styled it with those pants and leopard print clutch! 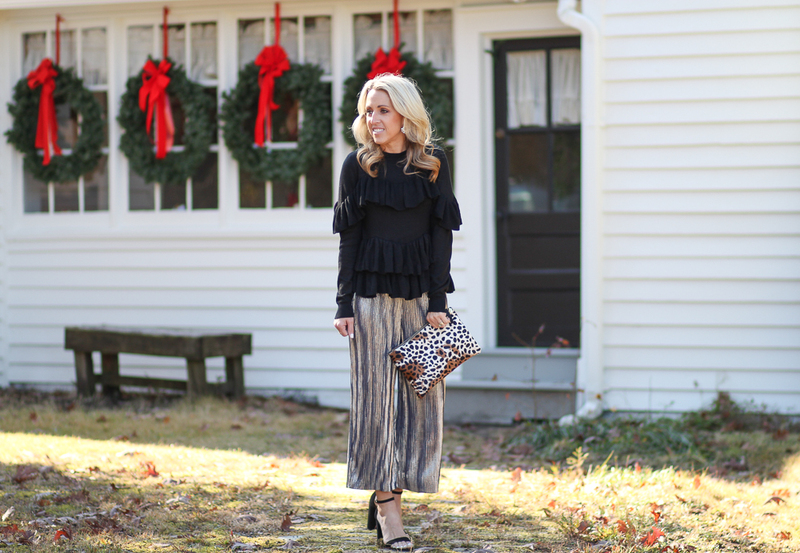 These pleated pants are too fabulous for words! Thank you for sharing them! Love those pants. They look cute and comfy. 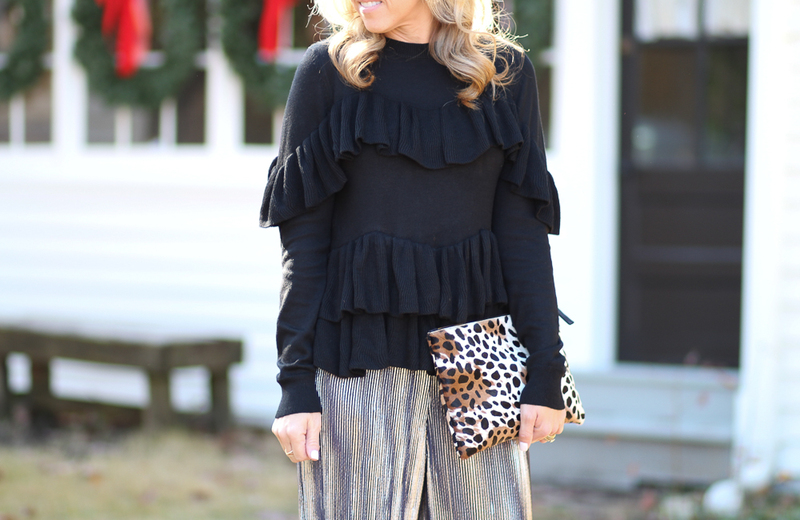 Love these metallic pants! Such a fun look! Your metallic pants are to die for! I love those pants! The metallic is amazing! Those pants are way to amazing! I need them! Oooohh those pants sure are a lot of fun! Definitely a good pair to have during holiday party season! Those pants are awesome! I loved the pleats & ruffle combo too!! I need these pants in my life! I prefer pants to dresses any day so this is a much preferred NYE outfit!